At Fleishman-Hillard's St. Louis headquarters, the "Adopt-A-FHriend" tradition returns this holiday season, providing donations of all kinds to those less fortunate. At Fleishman-Hillard's St. Louis headquarters, the “Adopt-A-FHriend” tradition returns this holiday season, providing donations of all kinds to those less fortunate. The voluntary program – just one example of the firm's holiday efforts worldwide – uses a large team of floor captains to coordinate efforts that help meet the great needs of several local organizations. The drive, which has been in place since 1999, starts with adding a seasonal touch to the office, with holiday trees or wreaths on each floor of our headquarters. Each tree or wreath is adorned with ornaments. 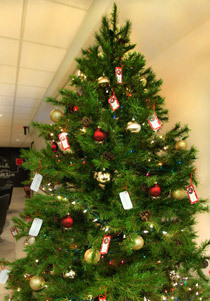 Employees can then select an ornament, which has a tag describing the gift requested for a child or an adult. They can donate this item or some cash – and let the elves do some of the shopping. This year, we're working with families from The Children's Home and Aid Society (CHASI) and the Caroline Mission, an early childhood education provider. We're also offering direct aid to two families in the storm-ravaged Northeast, complementing the firm's company-match efforts to support the Red Cross. We are also sponsoring 12 to 16 older adults total from Senior Services Plus in Illinois and Grand Oak Hill in Missouri. Additionally, we're setting up the mitten tree – collecting winter accessories such as hats, scarves and mittens – for Our Little Haven. Fleishman-Hillard typically adopts a couple of families from select agencies, as well as 15 to 18 senior citizens from other organizations. This approach directly helps 40-50 people each year, with some years exceeding 60. Gift cards, food, clothing, various household items (bedding, cleaning supplies and personal hygiene products), and toys are among the items we collect. For agencies that accept them, we collect gently used items, including clothing, baby gear, and small appliances. We work directly with the agencies to identify those items the families need most and, especially for those with younger children, try to identify one or two “want” items that are sure to provide a holiday smile. And much to our pleasure, we often receive thanks directly from the families and seniors we assist.